GONE: Steve Denison (centre).' Picture: Jonathan Gawthorpe. STEVE DENISON has resigned as Yorkshire chairman with immediate effect. The Financial Reporting Council (FRC) last week handed a £10m fine to PwC for its 2014 audit of BHS, which was sold by the businessman’s Taveta Group for £1 ahead of its demise in 2016. The FRC also sanctioned Steve Denison, the audit partner responsible, fined him £500,000 and banned him from performing audit work for 15 years. The White Rose county paid tribute to Denison, who succeeded Colin Graves in the post in March 2015, and said they will announce his replacement in due course. 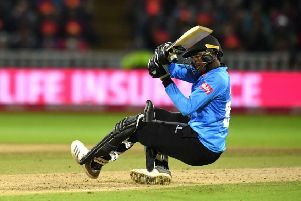 Denison revealed in an open letter posted on Yorkshire’s official website that he was standing down “with deep regret”. “The Yorkshire County Cricket Club is extremely disappointed to announce that chairman Steve Denison has resigned from the board, with immediate effect,” read a Yorkshire statement.